Simply substitute your Twitter profile name where my name (glenwoodfin) is. You can also replace your Twitter Profile ID number as well if you know it. 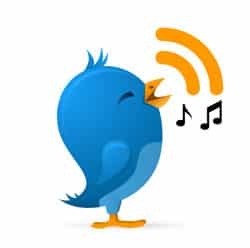 Some searchers may have found this post when searching for ‘how to find your Twitter RSS feed url‘ or ‘how to find my Twitter timeline’. These are one in the same. If you wish to find your Twitter Profile ID number, go to: http://idfromuser.org/ and type in your Twitter account name. Mine is: glenwoodfin. If the site above is down, which it is from time to time, I suggest you try: http://www.idfromuser.com/ as an alternative to find your Twitter profile id number. https://api.twitter.com/1/statuses/user_timeline.rss?screen_name=put-your-Twitter-account-name-here . Mine is: https://api.twitter.com/1/statuses/user_timeline.rss?screen_name=GlenWoodfin. Forget the number id! If you wish to show your Twitter RSS feed on your website that automatically displays your latest Tweets, there are several ways you can do this. This post is created on WordPress blog software and it comes with a free default plugin/widget that lets you copy and paste your Twitter RSS feed url in it and it will instantly display in the sidebar. To find this RSS widget, login to your WordPress dashboard and look down the left side to locate the ‘Appearance’ category. When you click on it, you’ll see the ‘Widgets’ tab, click on that and you’ll see the default RSS widget. Drag and drop it into the sidebar area, then insert your Twitter RSS feed url in the form, click save then click publish. You can show any feed in this widget, it doesn’t have to be a Twitter feed. In fact, look down the right side of this page and you’ll see my Tweets displayed in the RSS widget. If you have a static website, you can do a Google search for ‘RSS widget’ and find free ones or reasonably priced ones. Some of the free ones have a link back to the designer’s site, so I’d take that out of the code if you wish to hold more link juice on your page or buy a premium one without a back link to the widget designer’s site. To find your Facebook feeds, go here. Google is making it harder and harder to find your YouTube channel RSS feeds, but you can still find it by substituting the name of your channel ID with mine (glenwoodfin), just use my example here: http://gdata.youtube.com/feeds/base/users/glenwoodfin/uploads?alt\x3drss\x26v\x3d2\x26orderby\x3dpublished\x26client\x3dytapi-youtube-profile. Does Adding a Twitter Feed to Your Site Increase Page Rank? You have to be careful when decoding anything a representative from Google says on this subject. Notice Matt Cutts doesn’t talk about the ranking power of always having fresh content on your site or whether there is an added ranking benefit to people staying longer on your site while they are reading your Twitter feed, he only talks about adding a Twitter feed to get links. A sticky site (one that keeps people on your site longer, thus minimizing the bounce rate) can be good for ranking even though it’s only a small factor in the Google ranking algorithm. Matt Cutts only refers to one aspect of ranking, Page Rank, but there are well over 200 ranking factors in the Google algorithm. I say adding a feed is good for ranking all things being equal because it adds new content to your page every time you Tweet. Google Page Rank is a number assigned to a web page that starts at 0 and goes all the way up to 10. The scale is largely based on the number of other sites that link back to your site and the Page Rank of those sites linking in. To increase one’s Page Rank by one digit, you have to increase the links coming in by 8 times. Each level is exponentially based by a factor of 8. This is an educated guess, but it’s proven to be a good rule of thumb. You can install a Page Rank checker add-on to many browsers like Firefox, or simply go to a site like PageRankCheck.net and you’ll be able to find what any page is ranked. Bare in mind that Page Rank is only one of the factors in determining where your site comes up in a search, but it’s a strong indicator. If you Tweet about a subject relevant to your website, then I think it’s logical to conclude adding a Twitter feed to your site is a good thing. As an online reputation manager, I must have the edge over all other sites, especially major media like newspapers. I believe it will help in ranking even if the content of your Tweets is unrelated to your site, but it’s even better if your Tweets contain relevant content and keywords that have similar topics. Please re-Tweet this, Google Plus, and share on Facebook if you’d like me to continue to share content that makes a difference in your SEO and web site traffic. It means the world to me. I’ve been to 5 sites claiming to tell me what to do, and this is the only explanation that simply has the URL that I need to plug in. THANK YOU for clear information. Kick grass and take dames. I’m only interested how the mentioned site guess the twitter ID. There is no guessing, I listed a link that does the search for your numberical Twitter ID for you. Try it out. I misunderstood your question. I don’t know what process the http://www.idfromuser.com/ uses to find your Twitter ID number. Great question! It doesn’t appear in the rss feed logo anymore. I worked at it for 10 minutes. I have not been able to find a search feed either. When I do, I’ll post. Thanks. Great question! You might find this interesting: https://dev.twitter.com/. Just change TFB_Lovers (TFB_Lovers is my twitter username) with your desire username. Catherine, the post already explained this, beginning in the 4th line. Now, you owe me a drink. FYI: Looks like http://www.idfromuser.com isn’t working anymore. Yes, I’m bummed about it and I don’t know what the story is. Is there a workaround to find the user id? I’ve been trying to pull ID’s from http://www.idfromuser.com for two days. It pulled one after trying for hours, but no luck since then. Yes, you can do Google searches for your tweet and figure it out, or just forget about your Twitter numerical id, just use your account name instead of the number. For example, my Twitter id number is: 15793787, but there is no need to know that number, just use your Twitter profile id since it generates the same feed: http://twitter.com/statuses/user_timeline/glenwoodfin.rss. There is no need to produce the same feed with your numerical id when you can use the written one. Numerical: https://twitter.com/statuses/user_timeline/15793787.rss. Check it out. They both generate a feed with the same content (Tweets). The IDfromuser link is working again! I’m so glad you posted this. I spent a while trying to figure out why my twitter account worked just fine, but my client’s did not. Turns out this was exactly the problem, that my client’s feed was brand new thus it would only work with the newer feed style. Thanks! Very helpful article. Love the dog pic! Hi Gina, looks like you’re out there swinging the bat too. Oh, my dog says hi. Thanks! so easy to do. other websites give you lousy and long ways of fulfiling this task. Ok, but if I’m not interested un my tweets. If i just want to read my follows timeline, is there a tool or something that i could use to transform my twitter follows stream into RSS? In other words, instead of using twitter.com I want to use an rss reader to read my twitter. How I do that? Hope this helps you: http://www.techstartups.com/2010/01/14/fix-twitter-for-yourself/. Excellent tip! Thank you very much! Your Twitter rss feed is alive and well my friend. I took a screen shot of it for you: https://www.glenwoodfin.com/wp-content/uploads/2011/12/HQDN-Twitter-Feed-12-2-2011-12-17-40-AM.jpg . I found your numerical profile id Twitter feed too, it is: https://twitter.com/statuses/user_timeline/221619129.rss . So, you are good to go! Christopher, thank you for your expansion of the subject, however, I didn’t understand what didn’t work for you. The Twitter rss feeds I shared for my Twitter feed are working. Feel free to elaborate in an additional comment. The link you provided goes to a “suspended” account. If you send me a new link, I will edit your comment to display the new link. Ty for this quick explanation…have been hearing a lot about RSS feed lately and never paid attention what it actually is, then when I found up you can use it for promoting your website through twitter and pinging, I needed to know where to get that twitter RSS feed. So thx again for the info. Zeljko, for years I kept hearing about rss and feeds, but I didn’t understand them. Finally, about a year ago, I read everything I could find on rss feeds. RSS feeds primarily do three things: they notify the search engines that there is new content to index, allow people to subscribe to your content, and finally, one can tap an rss feed to post new content on autopilot on a different site. From there, one can do many exotic things with rss feeds that involve mashups (combining several rss feeds) and make your xml feeds sing. By listing your rss feeds in rss directories, you can gain more traffic when associated with your primary keywords in an anchor text link. I know this post is a few months old now, but a friend of my just passed it along to me because I was telling her that I’ve been trying to find out how in the world you could find Twitter RSS feeds these days. Thanks for the info. Sylviane, thanks for stopping by and leaving a supportive comment. Good luck with your Persuasive Article Marketing business. You’re welcome Les! Glad it helped. Twitter officially says they no longer support feeds, but thank goodness we can still find them. There are such great ways to syndicate your Twitter feed. By “no longer support” does that mean that soon the timeline url won’t be available anymore? Hi Richard, the official Twitter site used to have information about the Twitter rss feeds, but they have removed it. However, it still exists and can be used for syndication. My guess is they don’t plan to delete the feed, they’re just not telling anyone about it anymore. Hopefully, it will be a permanent feed. I have no knowlege of Twitter deleting their rss feed timelines. They sure would destoy a million feed widgets if they did. They stopped supporting Twitter feeds about a year ago and yet the savvy can still find them, so I’m guessing they are in no hurry to eliminate them. If they ever do, I’m sure they will come up with a propriety way of displaying them on your site. I don’t suppose there’s a way to find an RSS link that ignores/omits retweets? Ginger, there probably is a way to filter out reTweets from a feed. I have to admit that nothing comes to mind, but when you find something, please come back to share it. @Ginger if you are familiar with php you could probably use that to filter feeds; i’m working on something similar which lead me to this websites. @glenwoodfin The feed via Twitter profile name isn’t recognized by Google Reader, but the Twitter profile number found by idfromuser.com is. This is a change since I’ve been following Twitter streams in Google Reader for some years. Thanks for your directions. Thank you Glen, we were definitely looking hard for it and couldn’t find it. Normally it would be on the profile. Yes, their help pages say that Twitter has discontinued support for their Twitter feeds. I’m just glad we can still find them! You are correct in saying that Twitter used to publicly display the rss feed on your profile page, but they discontinued that last year. Great to see that barn behind you in your Gravatar picture. I’ll bet you’re a hard working woman. Wonderful!! Thank You. Thank You! You provided what many other sites simply failed to do. You provided actual information and instructions while other sites just babbled crap. Dan, thanks for your supportive comment. It means a lot. I hope my posts help you acheive your goals! My two primary feeds are https://www.glenwoodfin.com/feed/ and https://www.glenwoodfin.com/feed/atom. I also have a Feedburner feed: http://feeds.feedburner.com/GlenWoodfin. You can also subscribe to my feed through email on the upper right side of my blog’s sidebar. 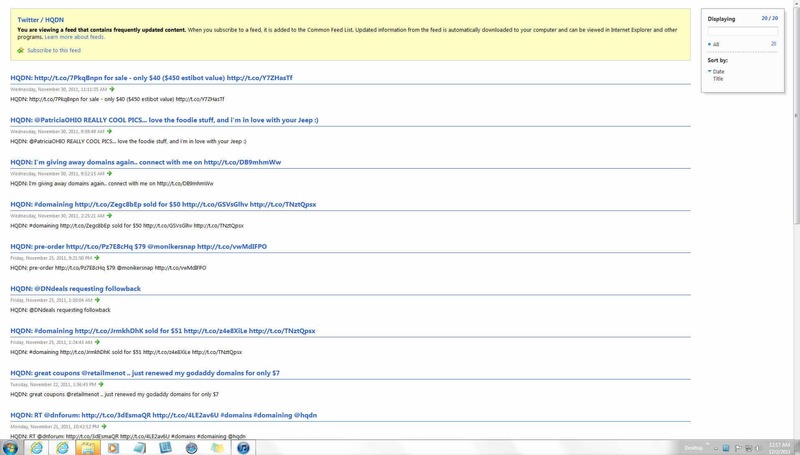 You will get an email every time I post automatically. To subscribe to feeds using RSS, you’ll need a feed reader like: http://www.google.com/reader. You can subscribe to multiple feeds on your Reader, so simply by logging in to your feed reader, you’ll have all new posts in one place. That way, you can keep up with new content without having to go to multiple sites to see if anyone has published a new post. A lot of sites have a built in feed. For example, blogs, YouTube & Twitter. Remove the brackets before and after the http://. Then, insert your Twitter ID. I think this may work for favorited tweets. Thanks Marisa on showing how to find one’s Twitter Favorites rss feed! Great tip! Great tip. I didn’t know how to find one’s Twitter Favorites rss feed. Thanks! Thanks, from time to time, one of the two Twitter ID sites is down. Glad it’s still working! I’m trying to use my rss feed on mine website thru wix.com but its not working. Hi Alex, I sent you a direct email asking if you could send me a link to your Wix web site, so I can try to detect and look at your RSS feed. However, if your web site url is: http://www.idancecouture.com/, then I wasn’t able to detect an RSS feed on your site. If Wix offers you the option of adding a blog page, then that will surely create an RSS feed. If not, then you could create a 3rd party feed through a free service like Feedburner (owned by Google). It doesn’t create an RSS feed, it creates an Atom feed which functions in the same way. You can add your site as is to feedburner without having to add a blog. All an RSS or Atom feed does is notify the search engines to scan your website for any new content so it will be indexed faster in the search engines and anyone that subscribes to your feed will be instantly notified of any new content you publish. The only other major benefit is you could add your feed to RSS directories which has the potential of creating more viewers if you feed is found while someone is searching that directory. There are other 3rd party feed creators as well in addition to Feedburner.